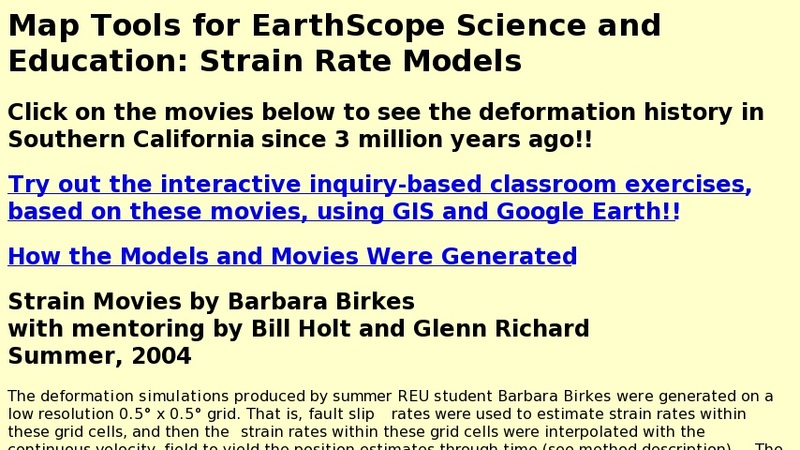 This collection includes movies, GIS data, and Google Earth KMZ files that represent models of finite deformation in southern California through time. The site also includes student activities using Google Earth and GIS. These animations were generated using geologic and geodetic observations and illustrate predictions of both horizontal and vertical changes through time. The movies can be used to present an overview of specific relationships between the North American and Pacific Plates, and to exemplify general plate tectonics phenomena. Using the GIS and Google Earth data, students can measure the size and direction of movement of points marked by city names, and changes in the positions of faults over time.